Posted September 5, 2018 by Sage & filed under Teaching, Yoga. 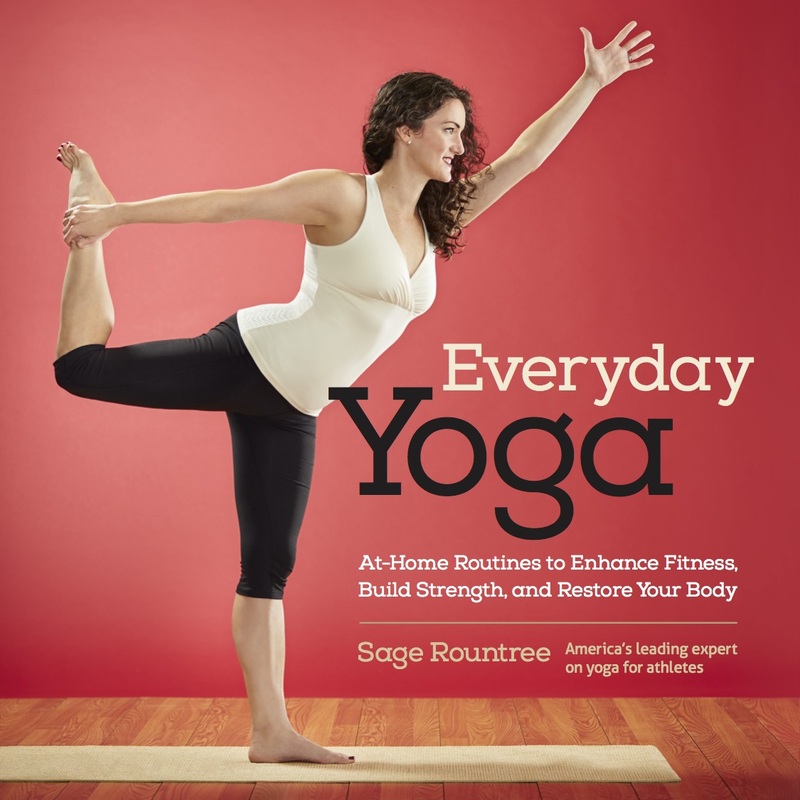 We designed this book for yoga teachers of every style, background, and level of experience; it would also be of interest to yoga practitioners who want to add depth to a home practice. In part 1, we discuss finding your authentic voice, how students learn, and ways to stay fresh and engaged through the years. In part 2, we offer 54 class theme templates, starting with concepts from yoga philosophy and expanding into more general themes, including some fun quotes and mantras. Each template has some analysis of the theme, suggested readings, and cues for things to say before, during, and at the end of each class. Part 3 then invites you to complete more templates of your own—do another 54 and you’ll have 108, enough to keep your teaching fresh and your students inspired for years to come. It was a joy cowriting with Alexandra, just as it was to work with her on Lifelong Yoga. Some extra fun came from our never knowing just who wrote what parts, and in the project of working on teacher development, which Alexandra does beautifully with Whole Mama Yoga’s 85-hour Prenatal Yoga Teacher Training and which I enjoy so much in the Carolina Yoga 200- and 500-hour teacher trainings and in the online courses at Sage Yoga Teacher Training. Whether you’ve gone through a training with me, are starting one of your own as a teacher or a student, or are just beginning to consider whether you would like to become a yoga teacher, I hope this book will provide you with hundreds of ideas to help you serve your students better. Preorder it today on Amazon to get the guaranteed best price—it’ll be out next spring. Posted August 30, 2018 by Sage & filed under Teaching, Yoga. 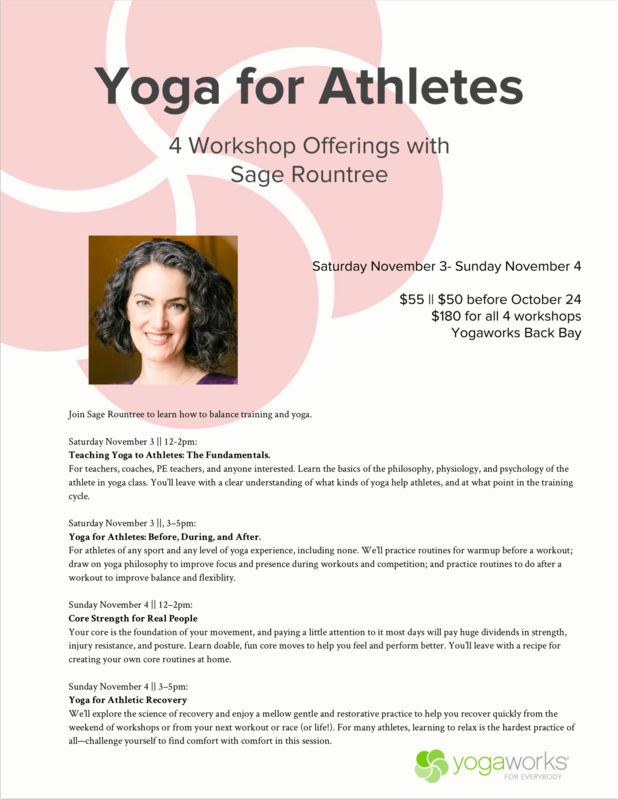 Meet Alison Whelan, the newest certified Sage Yoga for Athletes teacher. Alison lives in New York City, where she teaches yoga full time and runs a nonprofit called Breathe and Believe Yoga, focused on bringing yoga to those who would otherwise be unable to access the practice. A lifelong athlete, Alison played lacrosse in college before turning her focus to yoga. Like any NYC yoga teacher, she gets her workout offering a full schedule focused in Manhattan and will now be adding yoga-for-athletes class offerings as well as private lessons. Her broad teaching experience includes everything from chair yoga to heated power flow yoga, all influenced by the students’ needs. Speaking of studentship, Alison is also an ongoing student, which makes her compassionate to the experiences that can confuse or mystify athletes in their first class experiences. Alison’s background teaching trauma-sensitive yoga makes her an especially welcoming teacher for you to study with. Her classes feel inclusive and offer plenty of room for students to choose the right experience for them, moment to moment. Part of the course is a teaching video; in Alison’s, I saw a seasoned teacher who guides her students kindly, with great sensitivity to their needs. Read more about Alison at her website, alisonwhelanyoga.com. If you’d like to learn like Alison did, plan your trip to Kripalu for Yoga for Athletes Five-Day Teachers’ Intensive at Kripalu Center for Yoga and Health in Lenox, MA, January 6–11, 2019, to Carrboro for Yoga for Athletes Five-Day Teachers’ Intensive at Carolina Yoga Company in Carrboro, NC, July 15–19, 2019, or start your work on the course at Sage Yoga Teacher Training. Posted August 24, 2018 by Sage & filed under Media, Teaching, Yoga. My latest yoga video to stream at Yoga Vibes is Yin Yoga for Happy Hips. In yin yoga, we hold poses for a long time in order to target the connective tissues in the body. This short sequence works the hips in every direction. Watch the full video at Yoga Vibes. You’ll also find over 100 other videos of mine there, as well as several dozen from my excellent colleagues at Carolina Yoga Company. The code carolinayogaco will save you 25 percent on any subscription! Posted June 4, 2018 by Sage & filed under Yoga. My colleagues at Carolina Yoga Company and I are building a library of targeted videos for Yoga Vibes. You’ll be treated in the near future to wonderful content from Alexandra DeSiato, Jenni Tarma, and Laura Terry—some of Laura’s super helpful videos are already available. My first series is Building Blocks of Balance. It consists of three short videos that you can do on their own or combine into a balancing-pose bonanza. Find these and 100+ other classes from me, from short to long, at Yoga Vibes! Posted May 17, 2018 by Sage & filed under Media, Teaching, Yoga. 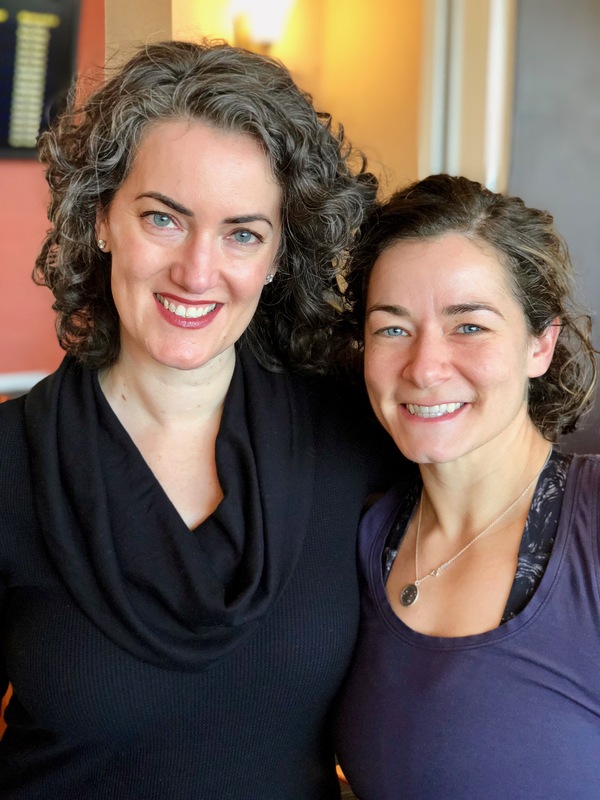 Alison Heilig is another colleague I met through Kripalu—she took both my weekend and my weeklong programs there in 2017, then returned this year to assist me, much to our students’ benefit and delight. 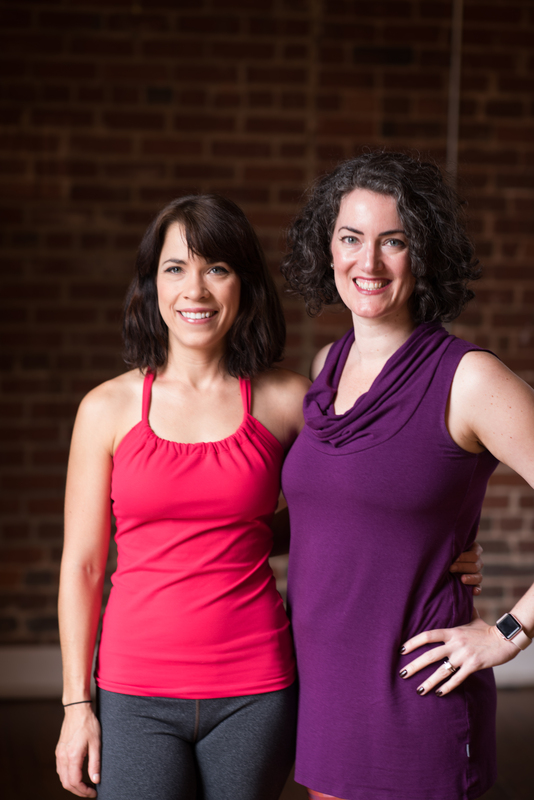 In between, she came to Carrboro to take Sequencing Yoga Classes from Welcome to Namaste (this is something you can do in person June 24–28, 2019, or online anytime at Sage Yoga Teacher Training). Alison has a wonderful skillset: she is a running coach and ultramarathoner, a CrossFit coach and competitor, a certified personal trainer, and a bang-up writer and yoga teacher. She also gives feedback in a way that’s both kind and inspiring, which is great for everyone who comes into contact with her in a classroom setting. And to complete the circle of inspiration, she is capable of eating nine egg whites in one sitting! I’m so grateful to work with and to learn from wonderful people like Alison! If you’re inspired by her as I am, you can get started helping people with content of your own by taking the Content Workshop.